From time to time you are likely to see comments, images, information or links that are not suitable or acceptable to be seen on the forum. When you see this type of content, do not post in reaction to it or ignore it. Please report it so that a member of the Moderater Team can deal with the post if required. The way to report a post is to click on the image that looks like a "!!" 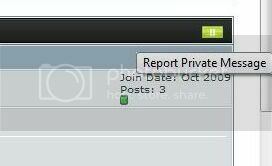 symbol that is shown to the top right of the post, above the members profile details. Complete the short form as clearly as you can with your reason for reporting to help the post be dealt with easily. This way, we can work together to keep the forum a safe place to be for all. Last edited by Nutter; 01-24-2010 at 03:36 AM.